Date: Wednesday, 30. 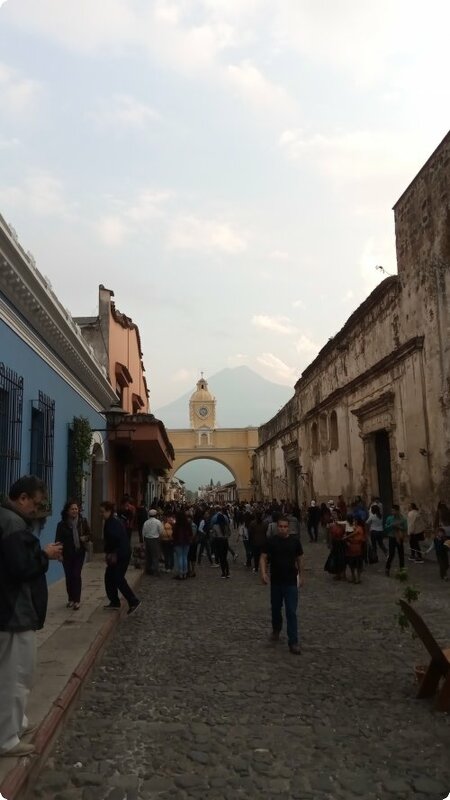 January 2019, Position: Hostal Antigüeño, Antigua, Guatemala, Mood: Medium! Well, looking at our position, you’ll immediately see, my dears: We are still in Antigua. And we have also decided to stay until Friday. Then we will try to leave early to meet Cisco at Lago Atitlán. There we want to stay a bit longer, and with the help of Cisco’s advice we also want to plan our further route through Central America a bit more precisely. Heike’s illness improved only slowly yesterday, and we said to ourselves that there is no point in having a strenuous day of driving now, only to sit in Chichicastenango and be sad not to be able to go to the famous market because Heike is not fit enough for it. Accordingly, there is of course not too much to report. Heike didn’t have a fever last night, but still felt very ill and complained about pain again and again. This morning she felt a little better and of course we hope that things will continue to improve. Oh, and of course we asked the Canadian KLR driver for the name: His name is Che! Seriously! When asked, he adds that his parents are hippies. Well, if that name doesn’t mean a very special vocation for a motorcycle traveller in South and Central America! Good luck and safe travels, Che! And I at least cut one sheet of our new stickers yesterday. That’s 49 pieces, and it doesn’t even take that long to cut a whole sheet like that. Now there are eleven sheets left. Maybe I can do another one today. In direct comparison, the stickers from Cobán can’t keep up with the quality of those from Germany. But at least we have enough to give them away now. Because that’s always fun and makes eyes shine! So far for the time being. See you soon, dear ones! Date: Tuesday, 29. January 2019, Position: Hostal Antigüeño, Antigua, Guatemala, Mood: Have felt better! Good morning (noon, evening, night…) Dear ones in the world. The last days it had already been anticipated, became more and more apparent, and now it is clear: Heike has now finally hatched her cold, which she has actually been carrying around since Puebla, Mexico, as an on-off burden. Ignoring is futile! After we went into town yesterday after a cosy morning, but Heike was already freezing and probably feverish, she went back to bed after breakfast today. Thick blankets and rest! Let’s hope it helps quickly. Actually, we planned to find a place to spend the night today in the surroundings of the active Volcán Fuego, from where we can watch the glowing lava at night. But we already gave that up last night. Makes no sense with Heike’s condition. Now we have booked another night here in the hostal. While Heike is resting, I will try to share my impressions of the last days. Heike already said that the route from Purulhá to Antigua was rather unspectacular. But there was another remarkable incident besides the motorcycle acrobats at the gas station: The second time on this trip that we were stopped at a police checkpoint. Apart from the permanently installed checkpoints, where one always stops, but then is usually waved further. So stop, raise the front o the helmets, smile and say ‘Buenos Dias!’. ‘Tienes documentos?’ Sure we have. So, very slowly gloves off. Then first take off the helmet (give them time to discover the wheelchair and take a close look!). A few questions, where from, where to? And then, while i get of the bike, further nice tranquilito, and get ready to rummage for the papers, they suddenly say: ‘Esta bien, señor! Adelante! And without further control of the papers or them even demanding bribes, (logically our immediate fear in view of the raised policeman’s hand) we are simply allowed to drive on. Worked out well for us! We hope, of course, that we will continue to get through so well. But we are not sure. This can be completely different, further south. Heike has already reported about the rumbling of the volcano, and about the ash dust, which covers everything in shortest time. The rumbling can be heard already at night really impressive clearly, and one can see the water in the glass on the bedside table curling. Wow! Yesterday another motorcycle traveller arrived here. Actually, we haven’t asked him his name yet. Not the most important thing at first. He is Canadian, and drives a KLR, just like Jesse and Simon, the other Canadians we met. He started in South America and is on his way north. And he has a problem with oil loss, which is very depressing for him, which of course we can understand very well! Today he went to Guate City to get new shaft seals. We keep our fingers crossed that the repair will work this time. One time he tried it unsuccessfully. ‘Hacemos Antigua acesible’ is a good laugh. Not that we would come here and expect perfect wheelchair accessibility. But here there is a beautiful Azulejo tile with a wheelchair on it every ten metres on some sidewalks. Only, actually the sidewalk is a pure pothole slope. At the crossroads there are ramps leading down to the road, which is made of the coarsest and loosest stone pavement. Hardly possible to cross alone with a wheelchair, I have biggest trouble pushing Heike on the rear wheels! Yes, at least on the marked sidewalks there are no signposts or lamp posts in the way. Only the partly quite steep ramps into the house entrances, where Heike almost tips out of her wheelchair, are really a challenge. And it’s pretty bumpy all over. But then, of course, with a lot of money you could make everything here perfectly accessible. But then a big part of the charm of this UNESCO cultural heritage city would be lost. We enjoy the city as it is, even if it involves effort. And we also see: the efforts for accessibility are of course all worth it! Even the small improvements seem to make a difference in people’s minds. And that probably counts the most. When people make room for us on the sidewalk, and we thank them, we are usually greeted, and a friendly ‘De nada!’ or ‘Que le vaia bien!’ follows. And this in a city almost overcrowded by tourists (which we, easily recognizable, are as well). Lovely! So, now I take a look at the sick camp, and maybe I’ll start to cut our 588 stickers printed in Coban, which were handed out on a few huge sheets, into strips. As rolls they are a bit unwieldy, and of course we need them individually to pass them on. All of you at home and all of you love! Until soon! Date: Sunday, 20. January 2019, Position: Ranchito de Quetzal, Purulha and Antigua Guatemala , Mood: Medium! After we had left Coban, we went directly to Ranchitos Del Quetzal! The ranchitos are in the rainforest, and it drips all day long from the huge leaves. All kinds of flora can be seen. Sure it would have been worth a walk through the jungle, but impossible for me. The evening atmosphere with the fog crawling over the mountains, the sounds of the jungle animals and at the end our small greenhouse in the middle of the forest. Indescribable! Although we stood on the mat at dawn at 6h, and waited until 8h for the Quetzal, he did not show himself to us. This morning we learned that we will see him better in Costa Rica. So, another chance. So we left for Antigua around 10h. Warned of the road 7W we drove over the 5 and the 14, a quite good road, but through one of the most insignificant landscapes we had so far. Except for a few young wild bikers, who did crazy tricks on their bikes at a gas station, there was hardly anything to see. The landscape was bare and dusty. Because of the Sunday a little less traffic it didn’t take long to cross Guatemala city. 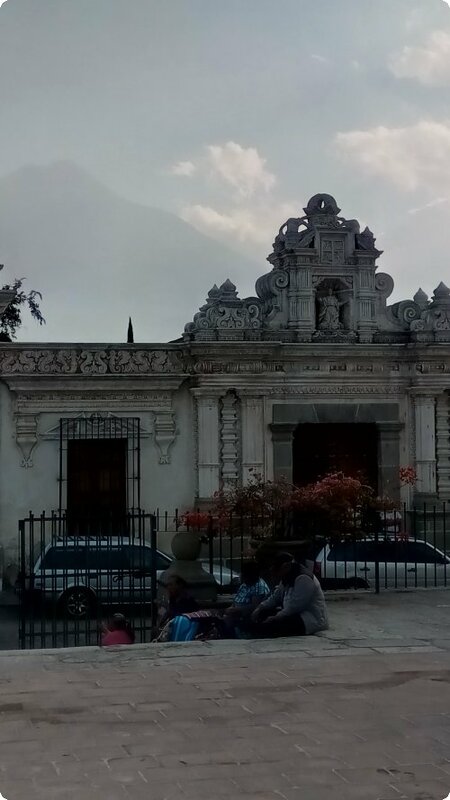 Guatemala’s capital is located in valleys and widely spread on hills. Interesting to see. At 15h we reached Antigua, and our hostal Antigueno. A pretty, not quite cheap hostal. Very quiet with a large garden and close to the central plaza. A first walk showed a very touristic small town. The Spaniards have built 18 churches here, and missionized enormously. There is even a privately owned church ruin that is not accessible to the public. All kinds of restaurants and coffee shops are to be noticed. We could only have a short look at the Volcano de Agua before it disappeared into clouds. The other two, Fuego and Acatenango, which stand behind the clouds, were not visible at all. In Antigua, it is said, besides Lima in Peru, there is the best food in Central and South America. Our host Christian thinks it’s because it attracts many people from other countries who then offer their typical cuisine. Maybe so. In the evening, however, there were clearly different dishes to be found at the food stands than before in Guatemala. For example tortillas with a chicken paste, avocado and salsa picante or a beetroot and carrot salad on tortilla (muy rico or mhhhhh!). Although the chicken soup, called Kak’ik, that Carmelita made for us in Coban, was so insane and will be remembered as one of the best dishes here. We visited another brewery, Antigua Brewing, and drank a delicious but expensive beer. I like the young people who are convinced of their business. Visions and change, progress. He told me that he went with some friends with some ideas to the city administration to make the city wheelchair friendly. And laughs and rejoices. During the night we could hear the active volcano. It’s like a super loud cannon bang, and then the windows start to clink. Today there is fine black ash dust everywhere. Even on the tablet as I write. Date: Sonntag, 20. Januar 2019, Position: Guatemala Petén Itza, Mood: Good! Dear ones of this beautiful world of ours! The picture does not fit so well, it is a bit ahead of time. You excuse! I have just no other. It was raining lightly when we left Belmopan. It rained more when we were on our way to the border to Guatemala. The border crossing would have been done quickly this time, too, if it hadn’t been for Sunday, and we wouldn’t have needed a photocopier. Because for the good customs fairy Vivian Alterio we needed just this one, because she needed a copy of all stamped papers. Well, with the copy shop at the border post closed, one of us would have had to go to the border town to make the copies in the copy shop there. As I always stood at the sidecar, and the vehicle always attracts someone, we asked them for a copier. He said that the disinfection site had one. Yes, it must always be. When crossing the border, the vehicles are sprayed with poison. Somehow ridiculous, because the same dirt is on both sides of the border. So we took a heart and asked there for our copies. If you don’t ask, the answer is no! For a tip equivalent to a Coke the thing was cleared, and we were back on the road. Faster than we thought. Hello Guatemala! Immediately I noticed that there were more huts made of wood or corrugated iron with palm cover, the people live poorer. 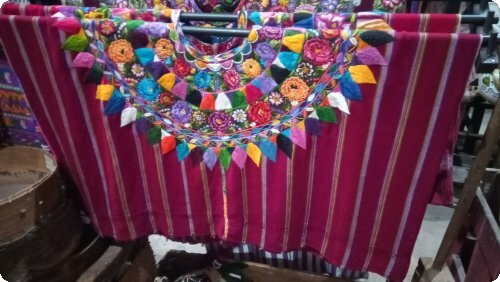 The women in the typical Gualtemaltek skirt and as top in matching color a crocheted “tablecloth”. More horses on the street sides. More suicidal dogs crossing the streets at random. I often close to sweat. The streets soooo so far ok. Until then, at least. Almost even more enthusiastic people and children in the streets. After a breakfast in the border town we went to Lake Petén Itza. In the late afternoon we found a hotel where it is allowed to camp. Included are showers and toilet use. Directly at the lake we put up our tents, enjoyed the view of the lake. It was quite fresh, and so I went early into my sleeping bag while the others waited for the “Bloodmoon”. Because it had cleared up to the joy of the others. We started super early. At 6h. Cold and only becoming bright, we packed up and bobbed up. It is an all morning sport for Toshi to try to pack up as fast as possible. I often feel sorry for him that I can’t help him at all. Tikal is big. Very big. Very unfit for wheelchairs. Even the 1,5 km to the main place of the ruins, the cemetery, which is bordered by temple 1 and temple 2, is a challenge. But there are still a lot of temples scattered around. The area is almost a day’s march from the point of view of someone who can’t march. About 20000 people are said to have lived in the city of Tikal. Around it in addition again 1 million. Three kings were found there. For those like me there was a shuttle service, a small truck with plastic benches. A ladder nailed together helped the passengers crawl up. I was allowed into the cabin, Toshi on the back. No belt and no idea what kind of way would follow. I spare you further details. Only so far: adrenalin, panic and relief as we stopped. Felt like I died when it suddenly went down incredibly steep. On the way back Toshi squeezed into my cabin. The driver didn’t like it so much. But my life was at stake! So I didn’t care. 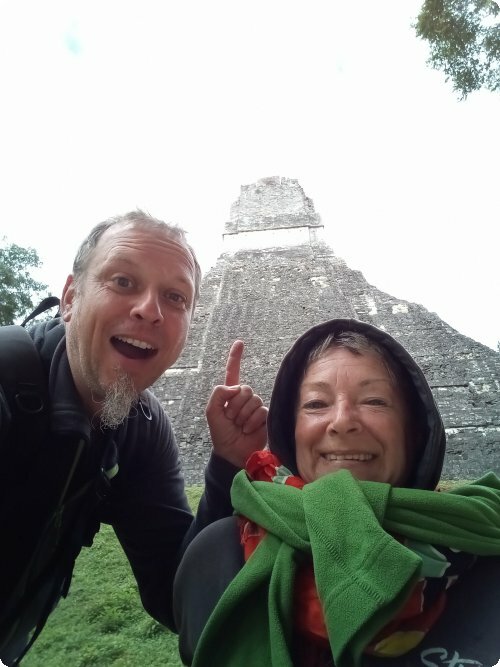 Tikal is cool, worth seeing, and only for extreme athletes. Even our two guys couldn’t take the last temple anymore. And they are almost 30 years younger. For me it is often very interesting in other ways, when I stand there, watch and wait. Often someone comes, sits next to me, chats for a while, and then the next one comes. Some also simply talk about themselves, their families or life experiences. I get the relevant information about the sights: Who, when, in which century, what, and so on, from waiting guides. And free of charge. Well, and seldom someone gets on your nerves. I can’t leave and say: “Sorry, I’m going to see the ceramics”. In the evening we reached Florés, Petén. A cute, very touristy little village on an island with a bridge access. We found a cheap hotel with parking possibility on the backside, which was only accessible via a road that was obviously flooded with water for a long time. Well, it happened, what had to happen after such a strenuous day: The stones slippery like black ice, the rear wheel of the thick one slid away, and the thick one with Toshi lay in the water. Jesse, who couldn’t brake behind us any more, was down too.What a shock. Of course I was afraid that something might have happened to them. Fortunately nothing had happened to Jesse and Toshi. Something had broken off Jesse’s bike. But nothing that can’t be repaired. It was a really long and exhausting day for the two of us. We were no longer capable of more than dinner and an evening beer. Especially since my cold was still a problem for me. The two boys even went kayaking. One hour for free was included in the hostel price. But the kayaks are leaking, and Jesse almost sank. Rather little recovered and I still sickly, it went on the next morning. 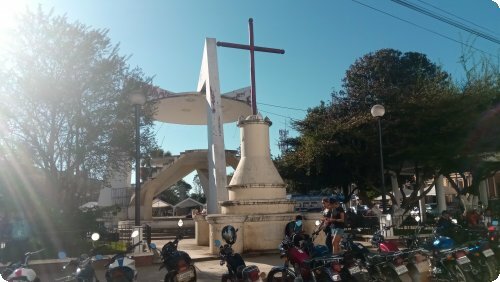 Our destination was Cobán. After a few things done in the city of San Benito, a horror road began. One of the worst things we have mastered so far. 10km sharp stones, broken asphalt, deep big holes filled with water, with sandy sections and often the choice between plague and cholera. Sacrifice motorcycle or sidecar. Each blow resembled a blow to the neck. Everything hurt in the end. Especially the legs, which only danced around in the sidecar. Everything got mixed up down there in the hem. From sheer anger, tension and pain I had to cry constantly. Then it got better, but not good. For the route to Coban the navigation system had calculated 3.5 hours. At the end we need 7.5 hours to get to our hostel in Coban. And as if it wasn’t enough, the hostel was full. We could only have camped, which the two guys did. But both of us couldn’t do that anymore. Toshi physically, I physically and psychologically at the end. Next door we checked into a bad and expensive hotel. Firstly, because we didn’t want to look for anything else, and secondly, because the boys continued driving in the morning and we wanted to say goodbye to them. Well, for the umpteenth time: That’s the price you pay if you don’t stop in time and exceed your own limits. Old topic, new dress. It was difficult for us to say goodbye to both of them. We were a great team! But on the other hand, we also realized once again what travelling means to us. Slowly let things have an effect on you. Use your strength to budget. Adjust the travel speed to the team and crew, so that not everyone is dead tired in the end, and then also exhaustion accidents happen. To our great joy we could stay the next day here in the Hostel Casa Tenango. And after Felix from Backnang and his 5 year old son Silas exchanged their room on the ground floor for the one on the first floor, everything was perfect. A house lovingly run by a widowed Gualtematekan woman with a nice team. A small home for 3 days. We regenerate slowly. Order us, our cargo and our souls. Organize some things for tomorrow’s journey. Some belts came to the tailor. Have new stickers made. A drinking backpack bought for Toshi. Ten handmade spokes for the wheelchair bought for two euros. Laundry washed, wheelchair cleaned. Coffee bought. Because this is where the coffee is grown. Delicious cardamom coffee purchased. Mhhhh! Tomorrow we go to a ranch further south, where the rarely seen Quetzal, a bird, is supposed to appear in the morning, because it lies in a biotope. It is the symbol of Guatemala and adorns every banknote in Guatemala. It would be great if we were lucky! All the best to the world of Heike and Toshi from Cobán Guatemala!